Some animals are born with a condition called albinism. That means that they don’t have any pigment or melanin in their skin. This is a super rare condition that rarely occurs naturally, if at all! Albino animals are more susceptible to predators, which means many don’t live long enough to pass on their genes. These albino animals that you’re about to see have survived, even though the odds were stacked against them. Keep reading to see some of the coolest, palest animals on the planet. Zebras are usually black and white, but not Zoe. Zoe is one of the rarest zebras in existence thanks to her unusual stripes, which appear white and gold. She was born on the island of Molokai in Hawaii in 1998 before being moved with her mother to the Three Ring Ranch, an animal sanctuary on the big island. 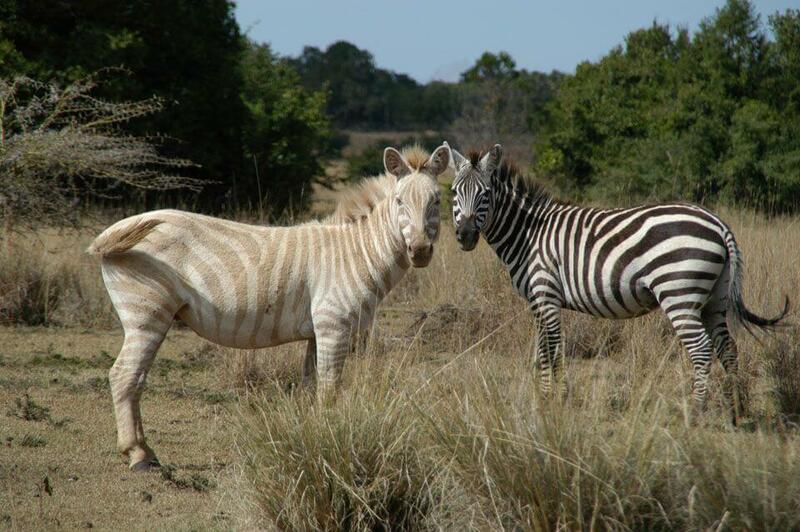 Zoe is the only known “Golden Zebra” in the world, but she actually doesn’t have albinism. Instead, she has what’s known as amelanism — a pigmentation abnormality.